In 2 months, we have gathered and filtered over 500 gallons of grease…for a savings of about $1,500! We have traveled 5,000 miles on veggie oil, with no problems. It takes approximately 1 -1. 5 hours to gather 100 gallons of grease. We store 20 gallons of extra filtered grease in containers in front of the RV so we can fill up the car when necessary. We have never had any problems finding grease. We have definitely perfected our techniques and have learned a lot in the past 2 months; we are much more confident and have the knowledge to handle most anything with the system. As with anything new, it took a little while to learn the ins and outs, but I cannot imagine ever going back to using gas in our vehicles. We are so happy with our decision to go veggie! As we were leaving Kansas City, we decided to stop and top off our tank of veggie oil. We were giddy with excitement as we went “hunting” for some good grease :). We pulled off at an exit with a lot of restaurants and headed toward a little place called “The Waffle House”. Matt got out and inspected the grease. Strike one. It was bad. There are many ways to tell if grease is bad…but I’ll save that for another post. So off we went to check out some more. Here is the official record…I think it’s safe to say that most of these places had just had their rendering service take their grease. Maybe Monday is a bad day? We pulled into Country Kitchen and Matt parked in the HUGE open space in the back. This is key for us. Because we are so large (32 feet plus pulling a car)…it’s harder to find grease that is easily pumped. So we were excited to find that this one was easy in/easy out. Matt went to check to grease first…you don’t want to bother asking about taking it unless it’s good. He gave me the thumbs up sign and headed inside. He got the “ok” and we were off! 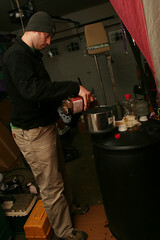 The first official pumping of veggie oil for the Live Lightly Tour. Momentous. We took what we could from their tank (about 15 gallons) and we were off. We went about 1/2 hour up the interstate and Matt decided to pull off on the exit and “just check”. I have a feeling that we’ll be doing a lot of “just checking” in the next year. It’s exciting to find good grease. (Disclaimer:It was our first try at this, so it took us a bit longer. After we get better at this, we’ll kind of know where to go and what places to avoid. Also, if you are converting your car, it’s a lot easier to just pull right in and out! Also when you stay in one place, you get to know the local restaurant owners and you can have a “contract” with them. It’s like your own little gas station…but free). We found a little mom and pop place called “Toot Toot Family Restaurant”. Family-run or smaller restaurants are usually better for finding good grease than chain fast food restaurants. As we pulled around the back, we both squeeled with glee as we saw THREE grease bins sitting there with a huge parking area surrounding it. Score! Matt filled up our entire 90 gallon tank and we were set for about 900 miles. Considering gas is about $3.00 a gallon, when we fill up a tank on empty, we save $270. 00. I like that! As we set off down the road, the feeling of satisfaction was overwhelming. We are so excited to be doing something that is environmentally friendly, having fun with our family, and at the same time educating others about alternative fuels. See the photo set of our first fill up here.